Along with the balance bar at the top of the Bills tab, you can now view your bills on a timeline! We think this will help you make better decisions about when to pay your bills. Prism is all about making sure you never miss a bill. The addition of the Bill Timeline is just one more visual way to achieve this. You'll see the entire month showing your paydays, bills, and the current day in one easy-to-view way! What if I want to use the old Balance Bar instead? Don't worry - you can use both! We think you'll really love the new timeline, but if you'd like to see the old Balance Bar, you can easily switch between the two using these new buttons on the top of the Bills tab. How do I use the timeline? 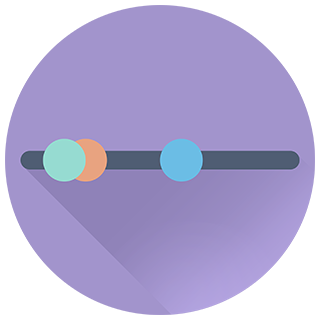 Just like the Balance Bar, you'll see your bills represented on the timeline by their associated color in Prism. Multiple bills with the same due dates will display as multiple colors on a circle. You can also see your paydays noted by a dollar sign, and the current day of the month as a date icon. Additionally, below the timeline, you will see the remaining number of unpaid bills for the month, and the total balance in unpaid bills left to be paid. We believe the combination of seeing your bills throughout the month and when they occur in relation to your paydays will help you make better decisions about when to pay your bills!